A great gift – £15 would buy a nice little hipscarf plus postage. £65 would cover a galabaya plus postage. Available in denominations of £5’s. There is an extra £1.00 per transaction for post and processing, but this is a one-off charge, ignore automatic calculations if you are ordering a combination of amounts. 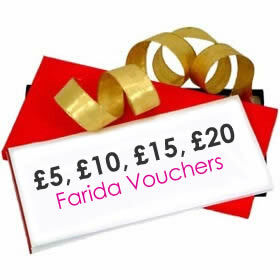 Email faridadance@mac.com or put a note on order if you want your vouchers sent insured or signed for post and we will find out cost.